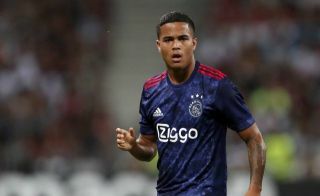 Ajax starlet Justin Kluivert has discussed a possible future transfer to the Premier League following recent strong links regarding talks over joining Manchester United. The Daily Mirror claimed just over a week ago that Jose Mourinho’s side were in advanced talks over bringing the young Dutchman to Old Trafford in what would no doubt be an exciting move. However, these reports may suggest a deal is closer than is actually the case, with Kluivert claiming he’d be open to playing for a number of other top clubs, including United’s Premier League rivals. The 18-year-old, son of Barcelona legend Patrick Kluivert, also name-dropped Arsenal, Chelsea, Tottenham, Barcelona and Real Madrid as clubs he’d be happy to play for one day. If you get a nice offer, you never know,” he told Helden, as translated by Goal. ‘England appeals to me: Arsenal, Tottenham, Chelsea or Manchester United are nice clubs where I can see myself playing in a few years. ‘Everywhere I go abroad they know my father, he often asked: “Come to Barcelona, I’ll give a tour of Camp Nou”. It remains to be seen if Kluivert will move at all in the near future, as he only recently made his breakthrough in the Ajax first-team. The youngster became a regular last season and has continued his rise this term, though it may still be a bit soon for him to be moving to a big club in the Premier League. United could do with that kind of quality in attack as they struggle to keep up with league leaders Manchester City this season.